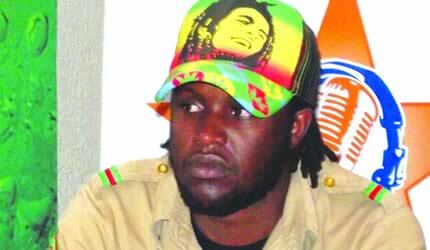 Many first heard the name "Guspy Warrior" on Winky D's Igo Figo album and on his smash hit 31 October but this 21 year old has many stories to tell than a highway patrol. His singles collection album "Time will tell" has 42 tracks (18 reggae tunes, 15 dancehall tracks and nine Shona songs). He is the son of legendary gospel singer Mechanic Manyeruke and his real name Emmanuel. The youngest boy in a family of seven (four boys and three girls) that make up the Manyeruke family believes that he is destined for greater things and is not apologetic about his sudden good fortune. “I was born a musician and music is my life. I studied up to A-level where I managed to attain eight points in commercials, but that was just to fulfil the education side of things because my dream is music,” he said. Most people would expect his inspiration or teacher to have been his father, but this 20-year-old is really different: “I would still have been a musician even if my father had not been one,” he declared. He, however, did not spring from the dark, the man behind this Chitungwiza-bred talent is also another popular dancehall maestro who goes by the name Templeman (Simbarashe Maphosa) and all he has is praise for young Guspy. “I have worked and still continue to work with Winky D, Culture Kid, Miss Smuffet, Gary B and Inno T, to mention just a few, but I have not heard or seen anything like Guspy. “He possesses a rare skill, which makes his lyrics stick out. It’s been just over a year since I first grudgingly listened to his demo CD, but, to tell you the truth, I am so hooked that I don’t even know what to do with myself,” said Templeman. The veteran club DJ said besides playing in clubs around the capital and going on tours around the country, his stable has decided to go full time into grooming young talent from the ghetto. “We manufacture our own PA systems, ‘manufacture’ our own artistes, play in the top clubs around the country, promote musical shows and now what we want is to conquer the region. “We want to take our artistes’ management programme around the country with the intention of identifying talent that we can bring into the mainstream before we go regional,” he said. Under Templeman’s Roughmix Entertainment where young Manyeruke is signed is also a new stable, Mafia 19, which is run by Guspy himself, whose main objective is to ensure that “whoever has talent does not starve”. “We are inviting as many artistes as possible to our stable in Chitungwiza where we want to assure the young artistes out there that where there is talent there is life. “To the youths I say if you have talent, don’t worry about money. Things will sort themselves out, just come sing for the people and make them happy. But they also should remember that music is a mission not a competition and that education is the key in whatever we may dream of doing in life,” said Guspy. Guspy’s singles collection has over five tracks topping the charts on the now very popular online radio stations with the track 31 October being one of the favorites together with others like Nowhere, When Mama Smiles, Cracker raMoze and Rastafari Son. At 20, the former Musengezi High School student is one of the few upcoming musicians who do not sing sungura but actually plays with a live band and he says he intends to keep it like that. As for what the father thinks of his reggae-singing son, Guspy says he believes he receives the best support a father can give to a son and is very grateful for his gospel-singing father.